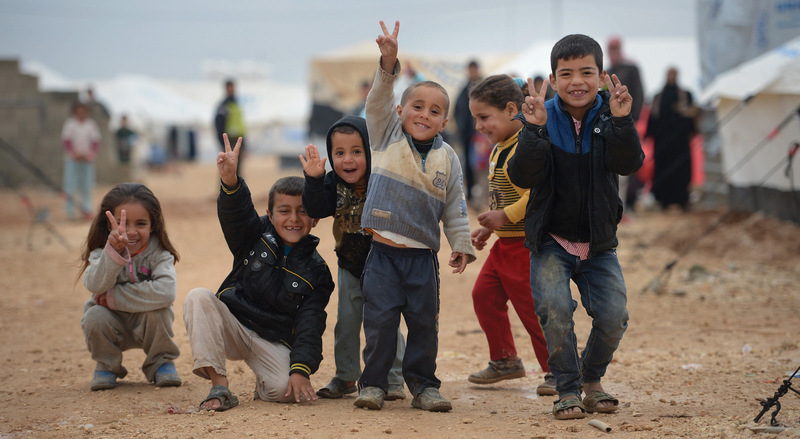 Children pose for a picture in the Za’atari refugee camp in Jordan. When the Arab Spring began several years ago, Syrians looked with envy at the freedom movements sweeping Tunisia, Libya and Egypt. Change seemed unthinkable in Syria, where everybody knew that you could be imprisoned for merely criticizing the president. And yet the unthinkable happened: in March 2011, Syrians began protesting against more than 40 years of tyranny. Four and half years later we can see the results of Assad’s savage assault on his people. Some 11 million are displaced. Barrel bombs, indiscriminate shelling, and mortar attacks have destroyed approximately 80 per cent of the country’s infrastructure. More than 150,000 prisoners of conscience languish in regime prisons and routinely undergo unspeakable torture. The overall death toll surpasses 240,000. In a country torn apart by violence, our call for democracy has been lost – the narrative of ‘Assad versus extreme Islamists ISIS’ leaves little room for the aspirations of millions of peaceful Syrians. Yet they must have a voice, not only to demand freedom but to articulate and understand what it would mean for all Syrians. The Freedom Charter project set about filling this gap. Inspired by South Africa’s 1955 Freedom Charter, the central document of the ANC’s long struggle against apartheid, we trained over 100 grassroots activists who then interviewed ordinary Syrians in every governorate of the country, as well as those now living in the refugee camps of Turkey, Lebanon and Jordan. The results were astounding. In the midst of a savage civil war, 50,333 people of different social, economic, political, religious and ethnic backgrounds dared to say what they want from a future Syria. Both activists and interviewees took huge risks. Many of these interviews took place under threat of injury, imprisonment, torture or death. One activist conducting surveys in Quneitra was killed, while two others were critically injured in Lattakia. In eastern Ghouta, outside Damascus, operations were forced to cease after threats by extremist groups. And what did people want? The right for all Syrians to live in peace and dignity; to freely practise their religious and political beliefs; to be equal citizens before the law. The Freedom Charter is the most comprehensive effort of its kind. It represents the first step towards a national-unity document based on the opinions, hopes and aspirations of our people. The Charter is now being circulated among parties with an interest in Syria – governments, NGOs, armed militias – even the Assad regime, and extremist militants. More Syrians are now signing up to the Charter, adding their voices to those of the 50,333 men and women interviewed. With enough support – our target for signatures is 1 million – the Charter will be a stepping stone in the long process of drafting a new rights-based constitution for all Syrians. At some point, Assad’s assault on Syrians will come to an end, as will his regime. The future of Syria will be negotiated. At every stage in this process we will present the Freedom Charter to all those who have a hand in the rebuilding of the country. They must hear us. We Syrians must be the ones to shape our destiny.